Happy Friiiiiday! 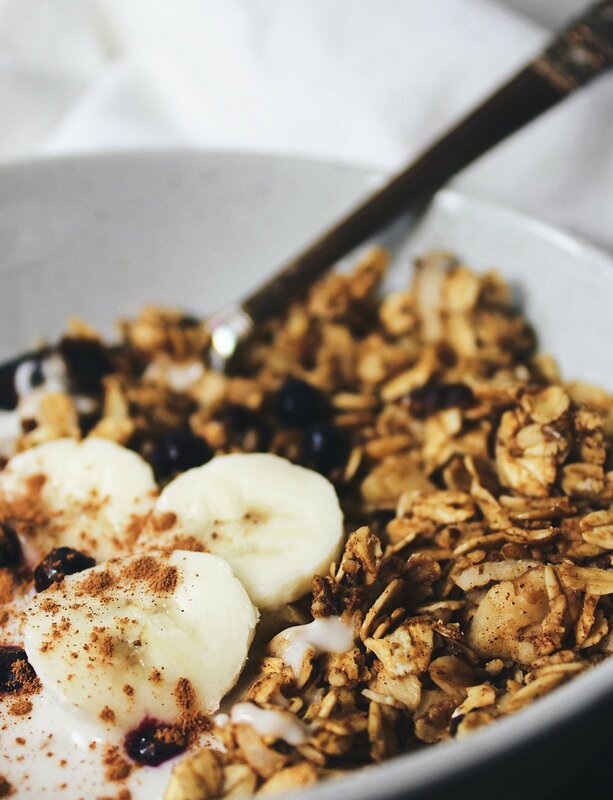 What better way to kick off the weekend than plopped on the couch, unwinding with your favorite shows, and a big bowl of granola with some yogurt?! Cashewgurt for me pleeeeease! SO, as you may know by now if you read my posts often, or just know where I live, I legitimately have NO storage in my apartment. Where do all my pots and pants go? Shoved away in my super small oven. Yes- ovens do come much, much smaller than the average size in a normal size home. I didn't know this until I moved in, and none of my sheet pans fit AT all. I had to get rid of half of my cooking/baking gear </3 And the one sheet pan that does fit, still doesn't allow me to ever fully close the oven. SO annoying. BUT, totally a functioning gas oven & stovetop so I don't complain much. BUT, this does mean that whenever I have to use my oven, I avoid it at all costs. Granola has definitely been up there for a while on my things to cook since Ryan could go through a box a day, and it's so much healthier and cheaper to make yourself. But, if you've made granola before, chances are you've baked it in the oven. Now, I'm all about baking a nice sheet of granola, but if that means emptying out my oven every 2 days when I needed to make a new batch, you KNOW that wouldn't happen. Confession: I dreaaaad baking for this very reason. Who wants to deal with unloading your oven, preheating, cooking, cooling, then re-loading it up again? UGH. The stress just typing it. *Notes: Of course this granola is SO simple to adjust depending on what you like. If I don't have all the ingredients above on hand, I'll throw in whatever nuts and seeds I have in my cabinet. So versatile- I love it!